Weird name. No donut for you. As always, awesomely done 😀 good work! happens a lot… esp when u shift to US or UK… and realise ur metabolism works differently in different countries. then u need to seriously cut back on ur calories… becoz even a simple meal of dal and rice adds to ur weight there, unlike in india!! 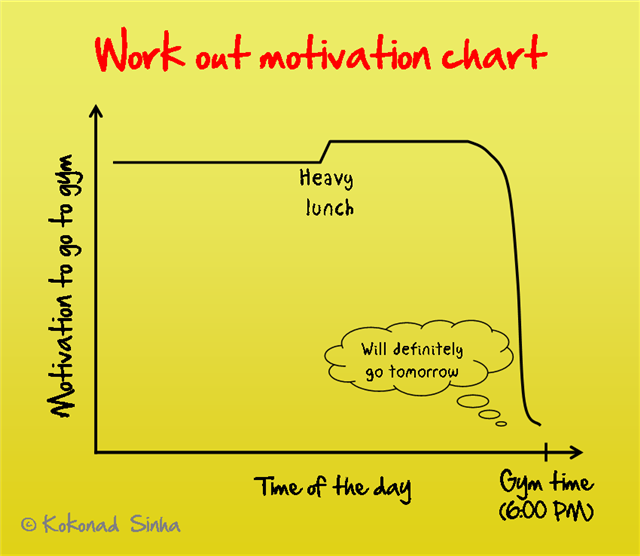 Haha, you couldn’t have portrayed the motivation graph better! of course, i stayed away from home food all that while… i’m never fat enough for mom! Roshmi´s latest post – A story of a warm hug and a kiss… of gratitude…! both the graphs and esp the video…. it thoughtful of you to include the second video too. Interesting, creative and humors – you did good! You sure do love your graphs – of course so do I. There should be an additional phase in that model. 2a probably. Which is “Delusion: Holding your breath and stomach in for fooling self or passing by girl”. I went from 28 to 32 flat (non pun unintended) in 3 years without ever leaving India. Imagine what Uncle Sam would have done to the bulge. Loved the second 2D btw, it really is so spot on. Cannot see your toes & the incomplete hug….such a riot Koke! I just got back from a long vacation in India and I feel like with all the sweets people were trying to stuff down my throat I’m going to have to up the gym routine to come back to optimal Archana, lol. They just never stop with the over-feeding, heh! 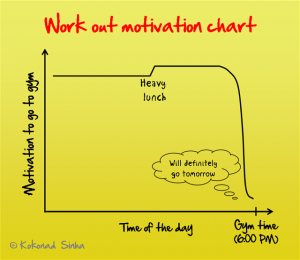 Ohhhh how many times have I said to myself….tomorrow is the day I will hit the gym! Excellent post and so well timed! Being less than two weeks away from my wedding when I’ll be wearing a tummy showing sari…I’m starting to get a little freaked out. Reminds me to look harder for that tomorrow gym thing! Auroracoda´s latest post – Bhabhi Made It Better…. haha.. loved this post and could relate to it so well.. am always wallowing in the stages u mentioned so i know it all too well..
u do an awesome job with the graphs i tell u.. LOL!!!! 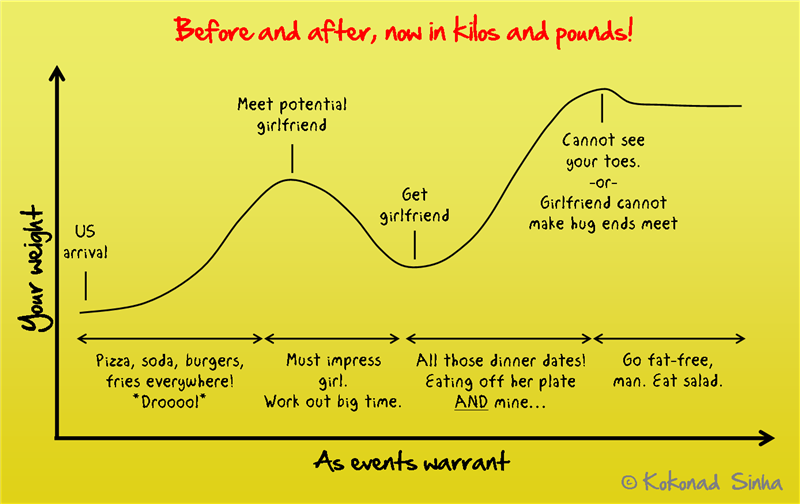 =)) love the graphs…can totally relate! TW´s latest post – I am back! Thank you thank you for the compliments! Somehow Indian food, no matter how much of it I eat (in India) never adds any weight! Sigh… makes me want to go back for 6 months just so I can lose weight! About the profile: I love that answer myself! 😀 I was proud of myself to have come up with it! Heh heh! I think that giraffe video is by Robot Chicken, but I am not a hundred percent sure… but that crying thing sends me into a frenzy of uncontrollable laughter! Wow. YOU ARE EXTREMELY EXTREMELY FORTUNATE! (The photos show, btw! :P) And thanks for the tag, as I have said already, yours was a lot of fun reading! Thank you sir! 🙂 I am glad you liked the graphs… yeah, I sure love them! LOL @ tummy showing sari! Well, I could tell you this, that the beauty of the sari is such that everyone looks phenomenally breathtaking in it! Btw, I liked how you talked about bear’s parents in your recent most post. Will head over there and comment on it. Thank you ajcl! 😀 I am glad you liked it! I am sorry that the ‘latest post’ goof up happened! I really have no clue why it did, though. And here’s a standing ovation for your achievement! 🙂 0P eh? Shopping in the kids’ section? Way to go (applause dies down slowly). I have heard eating home cooked food on a regular basis sure helps in controlling weight. Unfortunately, a busy schedule does not really help! Definitely see the videos! 🙂 I am glad you liked the graphs. More often than not, I come up with those graphs when someone is talking to me and I drift off. 😀 After the conversation is over, i quickly write it down in a place and look over the list later. The ones for these, I had thought of over a month back! Thankfully that has not happened! lol, good stuff and all very real too! Both the graphs are too true though. You vanished from the face of earth I say! I am glad you liked the graphs! Thank you thank you thank you thank you thank you! 🙂 I feel great that you find me worthy of the award. hullo kokonad! did the 34″ waist…fit? Mentalie! Long time no sie! okay now off to watch the giraffe video. btw the one on anorexia is awesomely made! Indyeah´s latest post – A nation forgets? And I love the giraffe video too – it’s such a mood lifter when he cries like that! It’s REALLY FUNNY! About my profile pic, that is me. Lying in front of my apartment complex here in my university. 🙂 It was taken by my roommate over two years back. I absolutely adore the photo because it is still me, but anonymous. I am happy you noticed! Hahaha, this is hilarious! It’s not that bad… I guess I’ve grown up out west, so I know what not to eat. Plus, I almost ALWAYS only eat Indian food 😛 On the contrary, I put on weight when I visit India! Grand sweets being closeby is NOT good for my health! Foreign Desi´s latest post – You can hear my voice. maybe you went to the us way too early to complete the last stages of anabolism-wins-over-catabolism while in india. heyy hi..came across ur blog throu ur ramayana on facebook post..!!! that was truely amazingly awsome..!! weighty issue’s has been a problem all over. so clicked away on this post…really amazing..!! im struglling throu break the ice of being over weight..since almost half a decade..!! looking frwd to ur posts..!! gr88 blog..!! God Bless u..!! Keep Smiling…! !